being a part of Team Natural means no one climbs alone. Behind every Team member there is a community of peers and coaches building them up, encouraging them, showing them the ropes, and supporting them. In climbing gyms across the country there’s a sense of camaraderie among each team’s members. Everyone is doing the same warm ups, all following the same exercises, and listening to the same coaches. The kids cheer each other on, belay one another, offer support, advice, and friendship. Even though each one of them tackles the wall on their own, they have a support network of friends and teammates to help them confront challenges and overcome obstacles. Team Natural gives the climbers the camaraderie they would experience in traditional team sports, while still giving them the freedom to blaze their own trail- wherever their climbing goals take them. Any youth may attend one practice at no charge to see if the Team is a good fit for them. 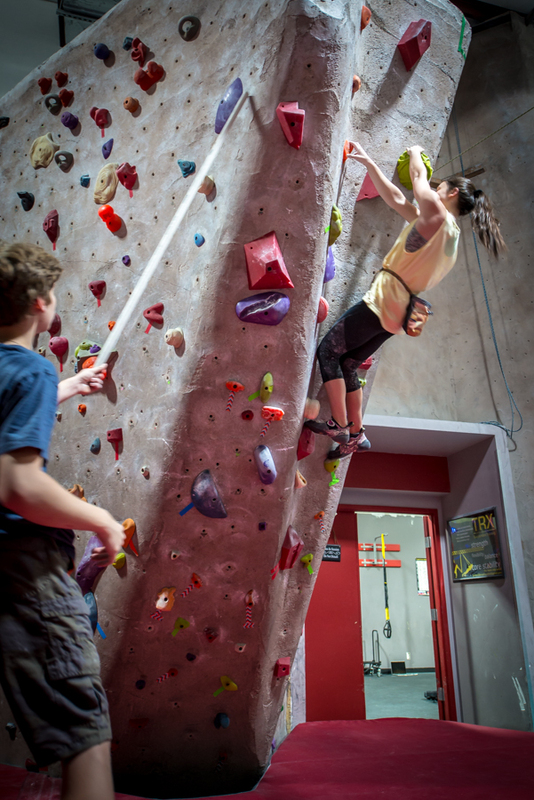 The youth climbing team is perfect for kids between the ages 7-17. We break them up into groups based on skill, so they can learn and grow together. Recreational Team: The Rec Team is great for kids of all ages. Rec team is perfect for kids who have been introduced to climbing and who want to climb better. The practices are structured with warm ups, climbing exercises, and workouts. We teach fundamentals of climbing and get into what it takes to start progressing in the sport. They have the passion, excitement, and determination required to become a better athlete. There is emphasis on focus, team encouragement, and individual discipline. Elite Team: The Elite team is only for hand-selected climbers who are dedicated and experienced. They are prepared to train specifically on what it takes to seriously advance in climbing. Elite team members are expected to climb on their own in addition to practice. They are encouraged, but not required, to compete in local and regional competitions in order evaluate their progress. Climbers on the elite team must have a solid grasp of climbing techniques and movements. They are expected to show discipline, responsibility, leadership, and teamwork while practicing in the gym. *Moving from Recreational to Elite is by coaches recommendation only. If your child feels that they are ready to move to the next level, you can make an appointment with a coach or the program director to discuss the next move. You can contact the program director by filling out the form below. Practice is every Monday through Thursday, from 6pm to 8pm. What do the kids do during practice? Practice lasts for about 2 hours. After getting dropped off, kids get their gear on and immediately begin a 20-30 minute stretching and warm up workout. Then they move on to a 90-minuted climbing session structured with specific workouts, drills, and movements to practiced. They are constantly supervised and encouraged by our coaches who know what each kid needs to get better. What about gear and equipment? Team members are allowed to use TRG rental equipment (shoes, harness, chalk bag, belay device, ropes, etc.) at no additional cost during practice but they are encouraged to eventually purchase their own equipment. Does my kid have to go to competitions? Competitive climbing is encouraged but not required to be on the youth climbing team. Each season provides several opportunities for team members to participate in local competitions. These local competitions expose climbers to fun new challenges and are a great way for climbers to assess their skill against other climbers in their age group. Our Elite Team is specifically geared toward training for competitions and therefor are expected to compete at least in the local competitions. Our practice seasons follow the USA Climbing schedule with Bouldering season in the fall and Sport/Speed climbing season in the spring. But what if my kid gets tired during practice? We always recommend that Team members eat a light snack and hydrate well before attending practice. Water breaks are frequent and if a climber needs an extra moment to recuperate after a hard climb then they will bet able to rest while another climber is being coached. Does the Team ever climb outdoors? Yes! Climbing outdoors is a huge part of the climbing experience and allows climbers to expand their range of skills outside of the gym environment. Several times a year we will provide opportunities to climb outside with our qualified instructors. These trips may have additional costs as well as certain climbing or behavior-related prerequisites associated with them. How do I cancel or put my Team membership on hold? Memberships auto-renew on the 10th. Membership change requests submitted after the 5th of the month may be charged for an additional month. Frozen memberships are billed $10 per month. Questions or comments about joining the team? Contact us using the form below.